If using cooked chicken skip this step. In a large pan, on medium-high heat, add 1 tablespoon of oil. Once the oil is hot, add chicken, season with salt and pepper, and sauté until cooked through and browned. In the same pan, heat 1 tablespoon of oil and add mushrooms. 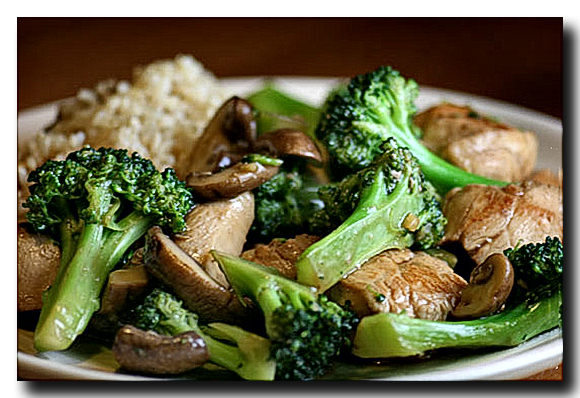 When the mushrooms start to soften, add broccoli florets and stir-fry until the broccoli is tender. Remove cooked mushrooms and broccoli from the pan and set aside. Add 1 tablespoon of oil to the pan and sauté garlic and ginger until fragrant. Add the remaining sauce ingredients and stir until smooth. Serve with hot rice or noodles. I buy a rotisserie chicken which will provide lots of extra chicken for these types of meals also can be used to make a great quick Bok Choy Chicken soup in less than 30 minutes by using the cooked rather than raw chicken to make this soup.